Postglacial Icelandic shield volcanoes were formed in monogenetic eruptions mainly in the early Holocene epoch. Shield volcanoes vary in their cone morphology and in the areal extent of the associated lava flows. 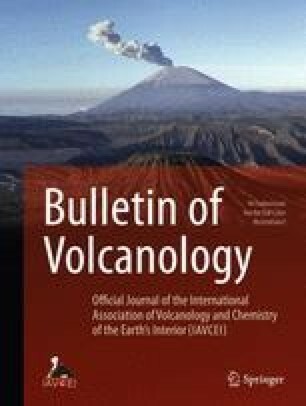 This paper presents the results of a study of 24 olivine tholeiite and 7 picrite basaltic shield volcanoes. For the olivine tholeiitic shields the median slope is 2.7°, the median height 60 m, the median diameter 3.6 km, the median aspect ratio (height against diameter) 0.019, and the median cone volume 0.2 km3. The picritic shield volcanoes are considerably steeper and smaller. A shield-volcano cone forms from successive lava lake overflows which are of shelly-type pahoehoe. A widespread apron surrounding the cone forms from tube-fed P-type pahoehoe. The slopes of the cones have (a) a planar or slightly convex form, (b) a concave form, or (c) a convex-concave form. A successive stage of a shield volcano is determined on the basis of cone morphology and lava assemblages. A shield-producing eruption has alternating episodes of lava lake overflows and tube-fed delivery to the distal parts of the flow field. In the late stages of eruption, the cone volume increases in response to the increased amount of rootless outpouring on the cone flanks. Normally, only a small percentage of the total erupted volume of a shield volcano, sometimes as little as 1–3%, is in the shield volcano cone itself, the main volume being in the apron of the shield.